On April 22, Mother Earth Day, there is a call to action for organizing rallies as a public display of growing opposition to three major pipeline projects in British Columbia. 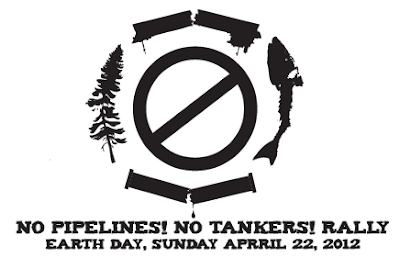 These pipelines include: Enbridge’s Northern Gateway Pipeline proposal, the expansion of Kinder Morgan’s Trans Mountain Pipeline, and the construction of Pacific Trails Pipeline by Apache, Encana and EOG Resources. Increase the unsustainable expansion in the tar sands and fracking for shale gas. Wreak massive environmental damage by crossing hundreds of salmon-bearing rivers and streams, the Great Bear Rainforest and mountainous and landslide-prone-land where spills could spell ecological disaster and affect the livelihoods of those living nearby. Increase tanker traffic and the risk of a spill in B.C.’s ecologically sensitive coastal waters. What better way to spend Earth Day then by inspiring awareness and appreciation of the Earth’s natural environment? Mark April 22, 2012 on your calendars, start organizing to hit the streets, rally together and make some noise! Solidarity actions across Canada and beyond are welcome. The Harper Government has suggested that the opposition to Enbridge’s proposal is being made by a small minority of people in Canada, foreign interests, or by “some” Indigenous communities. The government is ignoring the “Save the Fraser Declaration,” which has been signed by more than 100 Indigenous communities. Opposition to the pipeline proposal has also been expressed by the Union of BC Municipalities and Terrace, Prince Rupert and Smithers City Councils. There is also growing opposition to the Kinder Morgan pipeline expansion, and to Apache’s gas pipeline proposal as communities are becoming more aware of the devastating environmental and social impacts pipeline construction will bring. In the spirit of the global Occupy movement, it is time for us to put aside our e-mail and social networks, take a pause from writing letters and signing petitions, and make our opposition visible by collectively taking to the streets! Let’s show Harper and his corporate partners that the issue is not foreign-funded environmental groups. We all need to stand up to government and Big Oil and Gas industries that put profit ahead of the interests of people and the environment. Check Your Head: The Youth Global Education Network, Greenpeace Canada, Hospital Employees’ Union, Indigenous Environmental Network, Leadnow.ca, Northern Lights Wildlife Wolf Centre and Tanker free BC. Organizers & volunteers – Confirm that a few people can help organize a rally. There is no minimum number of people required to organize a rally, but having a few like minded people to work with makes things easier. You can also confirm volunteers for specific tasks, even though they may not be able to help with all of the organizing. Time and location – Be sure to pick a time that would be most suitable for people in your community to attend. Your location should ideally be somewhere symbolic to the theme of your rally or a location where you will be highly visible to the public. Be sure to consider accessibility needs of people that will be attending. Publicity & outreach – There are many ways to publicize the rally: through word of mouth, social networks (facebook, twitter, etc. ), submitting classified ads in local papers, putting up posters in your community and giving out flyers in busy areas or other events. You should also outreach to community groups and organizations that would support your event. Visuals & materials – The number of materials you need can vary, but it is important to at least have some signs, placards, banners and leaflets so that people know why you are there. Leaflets can be distributed to people attending and those passing by. Additionally, if needed, a megaphone or sound equipment can be used to project your voices and musical instruments as well as noise makers can help attract attention. Rallying the crowd – Someone will need to welcome people at the rally, explain to the crowd why you are there and lead people in chants. Simple or more creative chants can be used but it is best to prepare some in advance. You can also invite some local speakers to speak to the crowd about the issue (make efforts to have diversity among the speakers in terms of gender, race, age etc). Collecting contacts – Have a sign-up sheet at the rally so that you can collect the names of people that are supporters of your cause. Outreach for any future events will be easier and some people may want to help organize activities in the future.